Epoxy & Hardeners Archives - Goosebay Sawmill and Lumber, Inc.
105 Epoxy Resin is the base material on which all WEST SYSTEM 105 System epoxy compounds are built. Formulated for use with WEST SYSTEM hardeners (205, 206, or 207), it can be cured in a wide temperature range to form a high-strength solid with excellent moisture resistance. 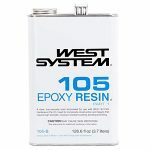 West System Epoxy is used for boat building, composite construction, and repairs that require high-strength, waterproof coating, bonding, and filling. 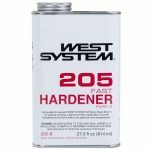 West System 205 Fast Hardener is mixed with 105 Resin for general bonding, fabric application, and barrier coating at temperatures as low as 40 degrees F. 205 is not intended for clear coating. 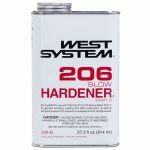 West System 206 Slow Hardener is mixed with 105 Resin for general bonding, fabric application, and barrier coating at temperatures above 60 degrees F. 206 is not intended for clear coating. 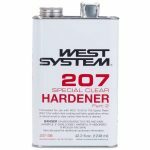 West System 207 Special Clear Hardener is mixed with 105 Resin for clear fabric application, clear coating, and general bonding. Will not blush or turn cloudy in humid conditions. 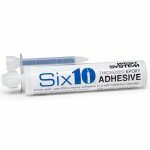 Six10® Thickened Epoxy Adhesive combines the strength and reliability and excellent physical properties of a two-part WEST SYSTEM Epoxy with point-and-shoot convenience. 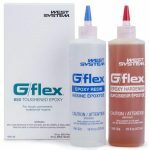 West System G/Flex 650 Epoxy is a toughened, versatile, liquid epoxy for permanent waterproof bonding of fiberglass, ceramics, metals, plastics, damp and difficult-to-bond woods. 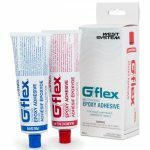 West System G/Flex 655 Epoxy Adhesive is a toughened, versatile epoxy that is conveniently pre-thickened for permanent waterproof bonding of plastic, fiberglass, ceramics, metals, damp and difficult-to-bond woods. 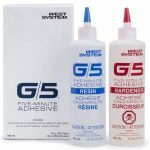 West System G/5 Adhesive is an easy to use, 2-part resin/hardener system for quick repairs, tooling and general bonding.